Archos announce the TV Connect: A novel way to get Android on the big screen! A couple of weeks ago we got word that Archos had had a decent stab at a handheld, Android-powered games console, the Archos Gamepad. One thing about that device which makes it stand out is its uniqueness; there's nothing quite like the Gamepad available from anyone else. It's this thinking outside the box from Archos which meant their latest invention catch our attention when it landed in our inbox too! Last week Archos announced the TV Connect. Essentially this is an Android-powered TV/ entertainment solution and it's quite intriguing. To quote Archos directly the device will offer you the ability to "control your TV just like a tablet - tap, swipe, zoom in, zoom out, select or type. With the TV connect users will be able to play games, stream videos, video chat in HD, email friends or surf the web all from their big screen TV", this literally is Android for the TV. To get a solid Android experience you'll need a little bit of horsepower and thankfully the TV Connect can offer you that too! There's a 1.5Ghz 'Multi-core processor', although Archos hasn't specified how many cores for some reason, 1GB of RAM and 8GB of storage which is MicroSD expandable. To top the whole thing off the device is running Android 4.1 'Jelly Bean'. If you're interested in picking one up then it'll be available in February and it'll set you back the grand total of $129.99. You can find full details over at Archos' website here. There's a small demo of how the controller actually works with the Android apps just below! Denver, CO – January 03, 2013 - ARCHOS, a pioneer in multimedia portable devices, is pleased to announce the ARCHOS TV connect, the only multi-touch "AndroidTM on TV experience" for your apps and games. The ARCHOS TV connect turns any HDTV into an Android powered smart TV providing the full Android ecosystem with a specially designed TV Touch remote. The TV connect allows you to control your TV just like a tablet - tap, swipe, zoom in, zoom out, select or type. With the TV connect users will be able to play games, stream videos, video chat in HD, email friends or surf the web all from their big screen TV. 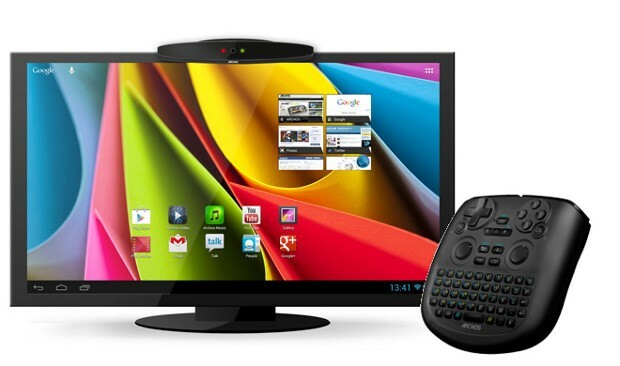 The ARCHOS TV connect runs Android 4.1TM 'Jelly Bean' and will be available starting in February, 2013 for $129.99. "As a pioneer in multimedia Android devices, we wanted to create a bigger, better way to enjoy Android," says Henri Crohas, Founder and CEO of ARCHOS. "The ARCHOS TV connect provides users with a multi-touch, multi-media Smart TV experience powered by AndroidTM."